Physical hazards have been the focal point for research on occupational health and safety for years. However, only recently emphasis has been placed on psychological hazards. To begin, a psychological hazard is any hazard that affects the mental well-being or mental health of the worker by overwhelming individual coping mechanisms and impacting the worker’s ability to work in a healthy and safe manner. Psychological hazards in the workplace include violence/bullying, fatigue, technological change, substance abuse, and age related factors. This post is dedicated to raising awareness to psychological hazards in the workplace and implementing appropriate measures for controlling them. Most often when you express to someone that you’re feeling fatigued, immediately their advice is, “Take a break” or “All you need is more rest.” Well, it’s much easier said than done. People need to realize that fatigue is more than just a feeling of drowsiness. It is a state of mental and/or physical exhaustion which reduces a person’s ability to perform work safely and effectively (Safe work Australia, 2013). When a person is fatigued, they are more likely to fall asleep on the job which can adversely affect one’s ability to concentrate, communicate effectively, recognise risks, and make decisions. This results in increased errors and reduced productivity in the workplace. For this reason, fatigue is considered a major psychological hazard. It is important, therefore, that companies first identify all the factors which could contribute to and increase the risk of fatigue in the workplace. Such factors include long working hours, performing repetitious work, inadequate rest, harsh environmental concerns, and non-related work factors such as poor quality of sleep, family needs, and social life. Once the risks are identified, employers should then take appropriate action to assess them accordingly. In order to assess these risks, companies should perform risk assessments to decide which hazards need to be addressed and in what order. After the risks are assessed, companies should implement appropriate measures to control fatigue in the workplace. Risks should be minimized as low as reasonably practicable. Employers should first perform a risk assessment to identify the existing or potential hazards. Introduce job rotation and break schedules/rosters to allow for rest and enough recovery time between work shifts for travelling, meal breaks, and socializing. Companies may provide a comfort room for employees to relax. Allow employees to work remotely or have flexible working hours. Encourage employees to voice their opinions by reporting any concerns anonymously that they may have in relation to work fatigue. Provide counselling for fatigue management on a one-to-one basis to their employees. Install ventilation and mechanical cooling devices in hot, confined work environments. Ensure the workplace and surroundings are well lit, safe and secure. A better environment will mean increased productivity. By implementing such measures, employees will be less fatigued and more productive. Image 2: An employee being harassed, bullied, and intimidated at the workplace by colleagues. Workplace violence is any act or threat of physical violence, harassment, intimidation, or other threatening disruptive behavior that occurs at the work site. It ranges from threats and verbal abuse to physical assaults. Violence in the workplace is a psychological hazard because it is caused by fear and anxiety of the aggressor. Apart from implementing stiffer penalties for those who are violent in the workplace, employers can find the root cause of the violence by tackling the issue individually and offering support to those who may be victims or aggressors. In addition, employers can implement panic buttons, video surveillance, alarm systems, and escorts to and from the workplace to help deal with or eradicate violence in the workplace. Bullying involves repeated incidents or a pattern of behaviour that is intended to intimidate, offend, or humiliate a particular person or group of people. It is a form of aggressive behavior in which someone intentionally and repeatedly causes another person injury or discomfort (Fritz, 2016). The most common signs of bullying in the workplace include spreading malicious rumours, social exclusion and assigning unreasonable duties that are unfavorable to the employee (Oppermann, 2008). It is therefore the duty of the employee to deal with the cases of bullying and the responsibility of the employee to report these instances. The employer can implement harsher penalties for bullies, foster improved communication skills and establish a policy of respect in the workplace in order to deal with bullying. We use technology to try to change the world around us to make our lives easier. In other words, technological advances show people a more efficient way to get things done and these processes often yield beneficial results. However, despite the benefits, technology can be considered a psychological hazard, better known as ‘Technostress’ which is one’s inability to cope or deal with technology in a healthy manner. When we perform multiple tasks simultaneously, our brains become overloaded. As such, we are unable to think clearly which can make us forgetful. This in turn affects our sleeping patterns as the stimulation from the overload keeps the brain working overtime. A few effective ways for preventing technostress in the workplace include taking regular tech breaks by listening to music, spending time in nature to calm the brain, completing one task at a time, and slowing down your pace. By doing this, you can become fully engaged in what you’re doing and the task can be done with greater ease. Image 4: The abuse of harmful substances or illegal drugs can lead to Psychological Hazards at the workplace. Alcohol – The abuse of beer for example can slow the reflexes of an employee if he/she is to respond or prevent a calamity from happening at the workplace. Cannabis – The use of marijuana can impair a worker’s memory if he/she uses it before and/or during working hours. This memory impairment can cause the worker to forget how to use a machine, equipment, or perform a process properly. This can cause harm to the health and safety of the employee as well as others workers. Hallucinogens – Phencyclidine (PCP) also known as Angel Dust, if ingested, injected, snorted or smoked by a worker before or during working hours can make him/her inattentive which can lead to fatal incidents or accidents in an industrial establishment. Inhalants – From hydrocarbon inhalation, an employee working on an oil rig for example, can become dizzy which could result in the employee falling on or between a machine or equipment where he/she can be seriously injured. Opiates – Employees under the influence of drugs such as Heroin for example, can contract Hepatitis B or C from injecting this drug into their body. The Hepatitis disease can spread to other employees by coming in contact with the infected person’s blood. Stimulants – Cocaine, if used by employees, can cause over activity which can result in the improper use of machines and equipment which will endanger the health and safety of other workers. Workers should be educated/counselled about the dangers of substance abuse. Periodic drug tests should be conducted. Image 5: Both young and old employees at the workplace are at a higher risk of incurring injury upon themselves. In the workforce, there are two primary categories of workers that require special attention when focusing on psychological hazards. These include young individuals and elderly workers. These groups are especially sensitive in the workplace because they are at a higher risk of incurring injury upon themselves as well as onto other workers. So how can age become a psychological hazard? In any organization, it is a blessing to have new, healthy, energetic and willing workers to join the company. However, there are also many issues that can arise due to a younger workforce. One major issue is lack of experience. Unlike older workers who may have been on the job for many years and know the “ropes”, these younger workers are now learning the various functions and with inexperience comes mistakes which can lead to major psychological issues such as depression and stress. Employers can therefore implement employee training and development programs which in turn will promote greater job satisfaction and performance. In most organizations, there are employees who have been present and loyal for years and with time, they are unaware that their increasing age has subjected them to various mental issues. This results in the inability to function and work as before. Firstly, their mental processes may decline which can result in slow decision making and the inability to understand directions, instructions, and demands of the company. Diseases also affect the ability of an elderly worker to display their best work in the organization and with age, many mental diseases become present. One such disease that is brought about by stress is “Sarcoidosis” which affects the nervous system including hearing loss, seizures, dementia or most commonly psychiatric disorders such as depression and dementia. Employers should therefore supervise employees to ensure that their work is carried out safely. What measures have been put in place in Trinidad and Tobago to deal with psychological hazards? The Occupational Health and Safety Act of Trinidad and Tobago (2004) as amended (2006) has outlined rules and regulations for the employer and employees to abide by. The act has made provisions for most hazards but failed to focus on the psychological hazards that plague the workplace. For this reason, further amendments to the act should include rules and regulations for psychological hazards in the workplace as it is just as important as other hazards. Furthermore, raising awareness to psychological hazards will improve health and safety issues as well as significantly reduce stress in the workplace. “Chapter 3: The Nature of Technology.” Chapter 3: The Nature of Technology. Accessed October 01, 2016. http://www.project2061.org/publications/sfaa/online/chap3.htm?txtRef=https://www.google.tt/. Fritz, Sandy. Mosby’s Fundamentals of Therapeutic Massage. 6th ed. St. Louis, Missouri, 2016. “Hepatitis C FAQs for the Public.” Centers for Disease Control and Prevention. 2016. Accessed October 01, 2016. http://www.cdc.gov/hepatitis/hcv/cfaq.htm. Categories: Hazards | Tags: abuse, age related, bullying, control measures, elderly, fatigue, harassment, Hazards, hazardsatwork, health, OSH, OSHA, prevention, psychological, psychological hazards, raisingawarenesstopsychologicalhazards, risk, safety, substance abuse, technological change, trinidad, violence, workplace, workplacehazards, young workers | Permalink. Title: 10.0 Earthquake… Natural or Man-Made?? This blog was based on the movie ‘10.0 Earthquake’. We know that earthquakes are natural disasters of which we cannot control, but did you know that they can be man made as well!? In the energy industry, there is a term called fracking. 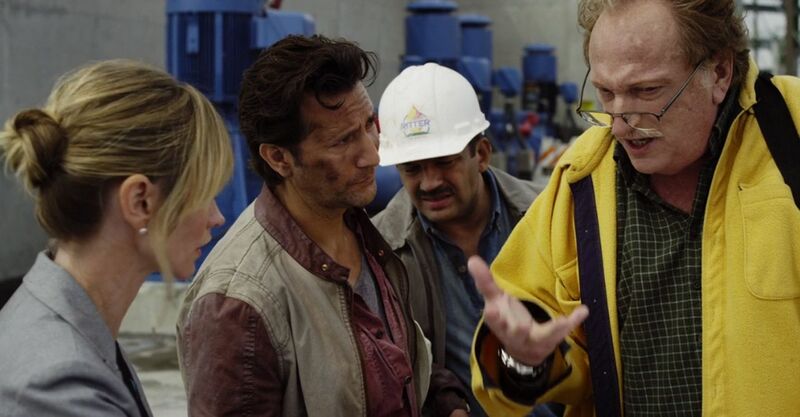 The movie referenced was thus based on the concept of illegal fracking and how it caused numerous mini-earthquakes and finally one major earthquake measuring 10.0 of the Richter scale. Saving the day was essentially the synopsis of the film, but along with it came a plethora of health and safety issues which we identified to aware you, follow bloggers and viewers, about the dangers which plague the industry. So what is fracking? According to Rinkesh kukreja the editor of Clean and Green Energy, Hydraulic Fracking is one of the more recent methods of natural gas and oil extraction. It involves drilling down deep into the Earth’s crust where there are deposits of shale gas and oil that the more usual methods of extraction have not usually been able to reach and injecting high pressured water into the rocks that contain the gas or oil. This water, mixed with sand and a special cocktail of chemicals, the ingredients of which fracking companies have not yet released to the public, causes the rocks to break.” CONFUSING?? My Apologies!. Try taking a look at the video below. The scene above, showcases two hazards, the first hazard; ergonomic hazard which according to the Australian Government Comcare website is identified as a physical factor within the environment that harms the musculoskeletal system, it includes repetitive/continuous action, manual handling, office, job or task design, uncomfortable workstation height and poor body positioning. Though we do not see some of these ergonomic hazards the scene above does show where Jack and the co-worker goes into a very dark confined plant space in search of what was causing the ongoing disturbance without doing a gas testing and atmosphere monitoring, they had to slowly walk towards their destination as they are not sure what objects are in their pathway making their job task very uncomfortable. Also in this scene Jack and his co-worker complained of smelling methane while entering the underground of the plant, thereby presenting the second hazard; Chemical hazard which would have been toxic, corrupting their breathing passageway. Although Jack and his co-worker were wearing helmets while underground, they were not fully prepped with Personal Protective Equipment as they did not have the proper body attire and they did not walk with their supplied air respirators and were at risk therefore Jack and his co-worker should have proceeded into underground plant equipped with fully operating torch lights and full gas masks and air respirators so that they could have see clearer and also so they wouldn’t be breathing in the toxic methane. According to the U.S National Library of Medicine, methane in high concentrations displaces the oxygen supply you need for breathing, especially in confined spaces. Decreased oxygen can cause suffocation and loss of consciousness and even asphyxiation. Solution/Learning Tips: Employees on or before proceeding into the underground of the plant, must make sure to do a gas testing and atmosphere monitoring to know if it is safe to proceed down under if the test are cleared of danger, proceed down the plant while walking with a heavily lite torch light on person, as well as supplied air respirators and proper body attire to protect one self from minor unseen hazards. 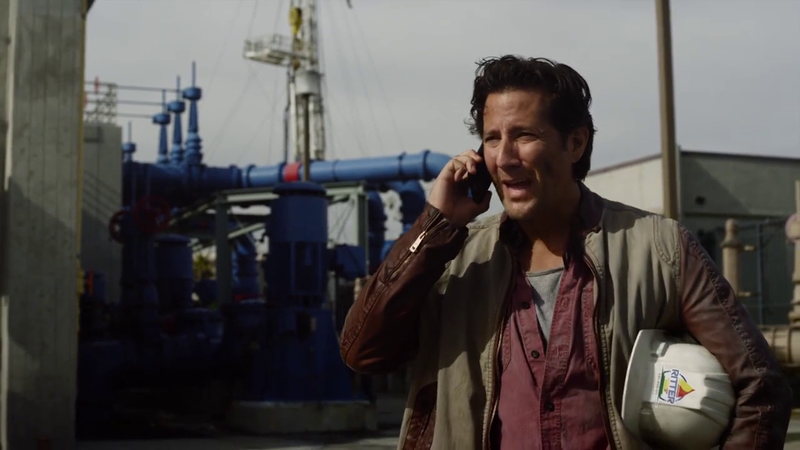 In this scene above the actor uses his cellular device near the refinery plant. This may be dangerous as mobile phones are not intrinsically safe, meaning that they have the potential to produce a spark of such intensity that it could ignite a vapour air mix. Which is especially prominent in a refinery. Although there isn’t sufficient evidence to prove this it still should be avoided. Solution/Learning Tips: Quickly move away from nearest plant and make the call, just to be safe. There are two images displayed above, the first image depicts a falling risk posed by the workers in the plant, as can see debris is rapidly falling from the above ceiling. The other image shows both Gladstone and Emily escaping the road breakout as a result of the earthquake. These two images displays the disastrous effects that the fracking posed as a result of causing earthquakes. Solution/Learning Tips: So to our fellow readers whenever there is a warning broadcast of earthquakes about to occur, persons must make sure to quickly execute their safety measures before, during an after the earthquake. Before the earthquake make sure you and your family are equipped with a first aid kit, a battery-powered radio, a flashlight, and extra batteries at home, don’t leave heavy objects on shelves as they will fall during the earthquake, anchor restrict heavy furniture and appliances to the walls or floors, always learn the earthquake plans for school and at work, in case the earthquake is about to occur and you are not home and finally make your own family plan of meeting after the earthquake if your family is by some reason separated. During the Earthquake make sure to stay calm, if you’re indoors, stand against a wall near the center of the building, stand in a doorway, or crawl under heavy furniture and stay away from the windows. If you’re outside, stay outside, stay in the open away from power lines or anything that might fall and stay away from buildings. Proceed to the nearest muster point, and as seen in the second image above, if you’re in a car, stop the car and stay inside the car until the earthquake stops else you can be crushed by falling debris. Coming closer to the end of the movie there is an explosion scene which is shown in the figure above. Explosions are classified as a fire hazard and are dangerous in many ways. Fire hazards can contain live flames, sparks, hot objects and chemicals that can potentially ignite or intensify a fire from becoming larger and uncontrolled which was scene when a small ground fire inflamed the helicopter and the skyscrapers. This is what occurs in the scene as a chemical explosion transpires. This explosion was most likely caused by a leak in gas lines of either propane or methane with a possible mixture of oxygen. Solution/Learning Tips: The best approach to prevent fires and explosions is to substitute or minimise the use of flammable material. If that is not possible it is important to avoid effective sources of ignition. Fire protection methods can also be used as they are measures that are taken to prevent fires from becoming destructive and reduce the impact. It involves the implementation of safety planning practices and drills that includes individuals to be educated on fires, research and investigation, safety planning and training. middle ear, lungs eyes and skin being burnt depending on pressure. There have been many cases in which damaged cylinders have become uncontrolled rockets or pinwheels and have caused severe injury and damage. This danger has happened when the cylinder valve broke and high pressure gases escaped out rapidly. Solution/Learning Tips: Employees while trailing the underground of the plant must make sure to walk with well supplied air respirators and proper body attire to protect themselves from hazards and risks, so that if same thing was to happen to them, that happened to Jack, they would not be inured, but will be able to effectively move to the nearest safe pathway. This can be prevented if there is sufficient training & testing of personnel, periodic inspections, proper operating conditions, relieve pressure from system, keep hoses short, secure cylinders and isolate plants far away from residential or commercial areas. Image 6: Jack, Stephanie looking for their daughter Nicole, and finally finds her. Solution/Learning Tip: This may be a challenging to solution to give, but the best solution is to just think positive thoughts, pray and believe that you will return to your family member and never GIVE UP! Jack and his co-worker could not have predicted that the metal pole would have fallen on the underground cover while they were proceeding out, but they became fearful when it closed because they were at risk from the broken gas lines and the steadily reduction in oxygen and they were not equipped with the supplied air respirators, they also could not have evacuated anywhere else because all the pathways behind them was too dangerous to even proceed. These actors are at risk in this scene above as full Personal Protective Equipment (PPE) is not worn while they are on the plant. 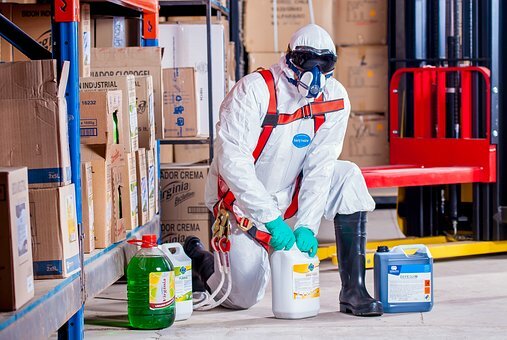 PPE is equipment that will protect the user against health or safety risks at work. It can include items such as safety helmets, gloves, eye protection, high-visibility clothing, safety footwear and safety harnesses. It also includes respiratory protective equipment (RPE). Therefore they should have the majority of these items if they are in the near vicinity of the plant. Solution/Learning Tips:This shows us that something will always go wrong in the workplace that may be detrimental to our lives so employees and employers must take the necessary precautions to have safe systems of work in cases such as trapped in confined spaces, lack of equipment and evacuation plans and procedures. It also shows us that Personal Protective Equipment (PPE) must always be present and worn correctly, it goes a long way in preventing serious damage to your body. While Earthquakes are natural disasters, there are opinions (eg John Vidale, director of the Pacific Northwest Seismic Network) that it can be caused by man and his lack of concern for his environment. Man is not just a threat to his environment and all the other creatures, but the greatest threat to himself. Had it not been for Organizational Safety and Health so many issues normally would go unnoticed. There were Physical Hazards, Chemical Hazards and Psychological Hazards the combination of which was leading to a National Disaster. It is clear that being ignorant to the safety and health issues that can occur does not mean they are not already present. There is an old local saying “what miss yuh, eh pass yuh”, that is to say, not because it has not happened yet does not mean it will not. The damage to our environment might not be realized in the near future but may eventually present itself. Categories: electrical hazard, Hazards, Physical Hazards | Tags: biological hazards, control measures, employee, Ergonomic hazards, Hazard Prevention, Hazards, health, OSH, personal protective equipment, prevention, risk, safety, trinidad, workplace | Permalink.